Whether it’s scoring goals, setting them up, or dropping the gloves for a fight, Brett Bulmer is willing to do what it takes to make Fife Flyers successful. The former NHLer almost managed all three in Saturday’s win over Guildford Flames, only the lack of an assist on the gamesheet denying him a Gordie Howe hat-trick. His stunning overtime winner followed a first period fight with Guildford namesake Brett Ferguson after he took exception to a hard hit on team mate James Isaacs. It’s the type of contribution that helps the 26-year-old Canadian live up to his billing as a marquee summer signing. “I try to do a little bit of everything for this team,” Bulmer told the Press. “If I have to step up for a team mate I’m always going to do that, and to score a big goal in overtime was a great feeling. Bulmer picked up the nickname Hollywood during his time with Florida Everblades last season due to his tendancy to score spectacular goals. After a headline-grabbing strike in Belfast earlier in the campaign, Saturday’s solo effort - his 16th goal of the season - was further evidence of his finishing ability. “Maybe I need a couple of greasy ones to balance it out,” Bulmer said. “I’m trying to go to the net as much as I can. I just try to put myself in a position to score every night. Bulmer has totalled 40 points from 36 league games thus far, second only to Paul Crowder in team stats, and is enjoying being a team leader. “I’m feeling good right now,” he said. “If I can generate early it brings my energy and momentum up during the game. Right away I’m trying to get involved either by throwing a hit or making a play - and then I just try to capitalise when the real chances are there. 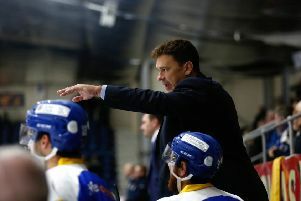 Bulmer was speaking after a weekend that saw Flyers claim three points as they followed up the win in Guildford with a penalty shots defeat at home to Nottingham Panthers. “Going down to Guilldford is a long trip and tough on the body,” he said. “We played a solid game there, everyone came to play again and that’s what we ask. “To get that win was huge, we all felt good about it. “Coming home on Sunday, we felt we played an okay game, we just couldn’t convert our chances. “That’s discouraging, but the chances are there so that’s a positive. Flyers are currently fourth in the EIHL standings, which if they hold onto will be their highest ever EIHL finish, but Bulmer is setting his sights higher. “I think we’ve set a standard this year of trying to be in that top three, and trying to be a premier team,” he said. “There are some big clubs who have been at the top for a while, and we want to be part of that, and part of the winning culture.